Good Morning Crafter's. Kate here with you today to share a simple treat that you can make without using any cutting machines, well maybe just the Cuttlebug or Big Shot. 3 x 10 Clear Bag, Fancy Topper Die, Mini Tag Die and Christmas Candies. Don't forget to join our Challenge over at Jaded Blossom. This is super cute! Love that you don't have to use an electronic machine...super fast! Cute!! Love this, I've been trying to figure out what I'm gonna use those bags for. Yummy cuteness! Love all the wonderful layers and pretty papers! yummy! 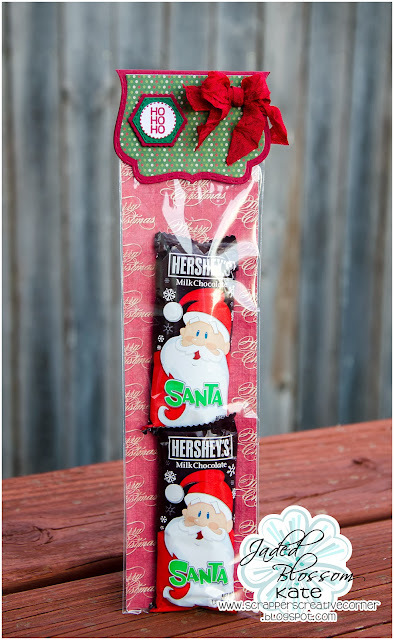 I love the paper...great treat idea!